Driveways & patios, decking, turfing, fencing, walls & timber framed garden buildings. Call 01245 248 484 to talk to us today. We will give you a free consultation giving full professional advice on your intended garden improvements in Chelmsford & Essex. We will discuss with you the suitability of materials and also provide a free fixed price quotation for the proposed project. Give us a call today to discuss your ideas for improving your garden, we use the best quality materials and are competitively priced for a high quality, long lasting end result. Just a quick letter to say we are so pleased with our new garden! No corners were cut and top quality materials were used, which is what we were after. Professional and reliable right from the start. We can't wait to show it off! Thanks again Danny. A few of the hard landscaping tasks that we can do. A driveway or patio can enhance your property's look and increase its value. We aim to complete the construction of your driveway or garden patio as quickly as possible and with minimal disruption to your daily life. Call us to arrange a consultation to discuss your requirements and suitable materials. Raised beds can be the perfect choice for the less mobile or elderly. They can also improve drainage and introduce a new soil type to your garden and are popular for growing fruit and vegetables in a contained, raised area. Decking can add style to your garden. 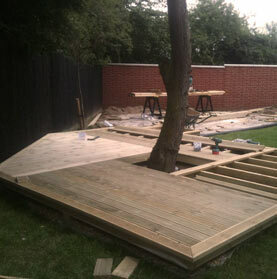 Allow Greensteds to design, create and build the perfect garden decking, built in either hardwood or softwood and shaped to your requirements. Garden decking that will be unique and suit your garden perfectly. Whether replacing tired old fencing or starting afresh, garden fencing can add privacy or simply define garden borders. Choose from picket fencing, close board fencing, overlap fencing and trellis. Whether constructed as a retaining wall or a decorative wall, Greensteds will build you a garden wall that will last. We can help choose the right grass turf for your particular lawn area, whether in shade, partial shade or full sun, we will provide the best type of turf for the job and turf your lawn to the highest standards. Pergolas, garden arches, garden sheds, raised bedding areas - or maybe you just want a garden seat to sit on and relax. Wood is a versatile material for adding that extra something to your garden. We build sturdy, long-lasting timber/wooden constructions that are not only practical, but will also last a long, long time if cared for properly. A wooden arch or garden seat will enhance the look of any garden. Email us or call us on 01245 248 484 to discuss your ideas.